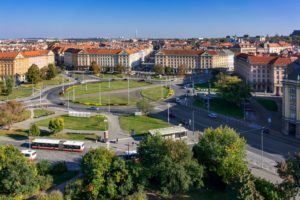 On November 13, 2018, the long-awaited, revitalized future of Victory Square in Prague, Czech Republic finally came into focus. That’s when the Prague Institute of Planning and Development (IPR) announced the winner of the architectural competition for the redesign of the important but automobile-choked and largely inaccessible square. Car-centric Victory Square as it looks today. Photo courtesy of Prague Institute of Planning and Development. The design deemed best by the expert jury diverts all traffic away from the center of the square. The space will be entirely transformed. The authors of the design are Pavel Hnilička, Eva Macáková and Josef Filip. 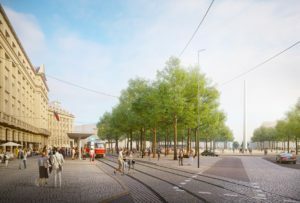 In the new design, the tram tracks will no longer cut through the square, but will run along the west side (Evropská Street). The proposed traffic plan will accommodate more cars than today and will facilitate traffic flow. The center of the roundabout will then become a functioning space for universal use. 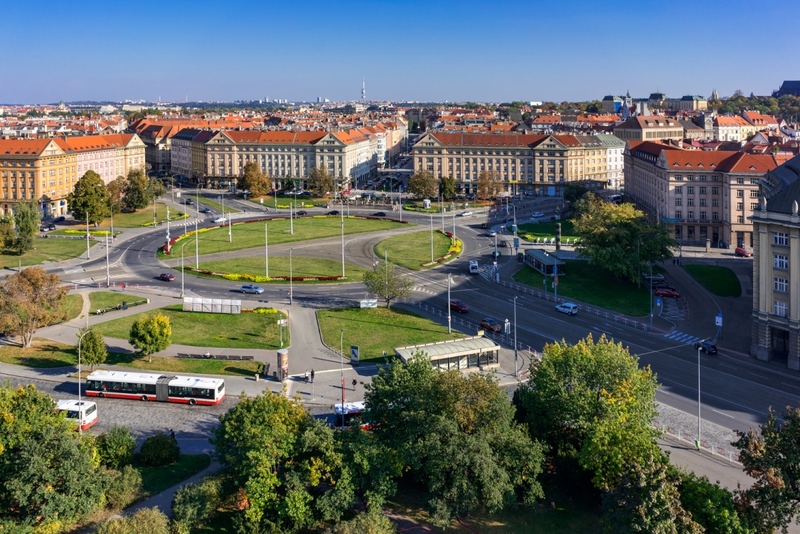 “I am pleased that the chosen design carries on the legacy of Dejvice urban planner Antonín Engel and also offers greater opportunities for public use. 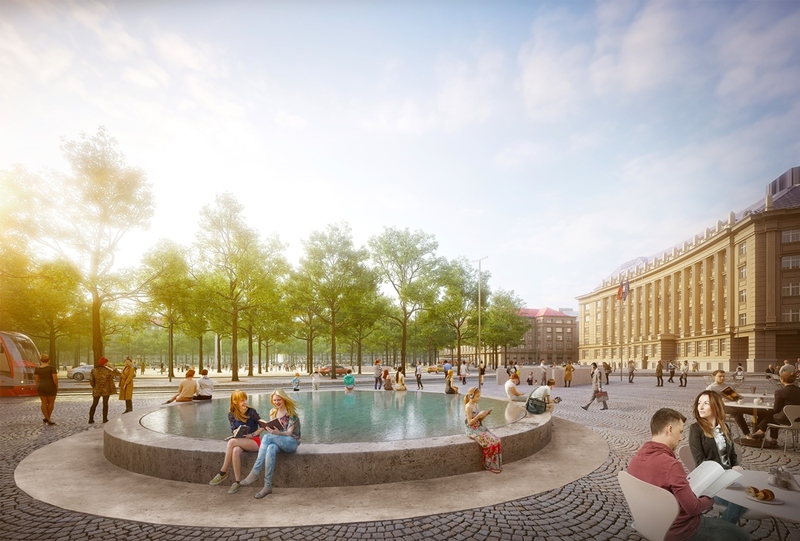 The proposed design will transform Victory square into a greener and more attractive place where people will want to spend time,” explained Petra Kolínská, Deputy Mayor. The planned placement of trees was very well received by the jury. 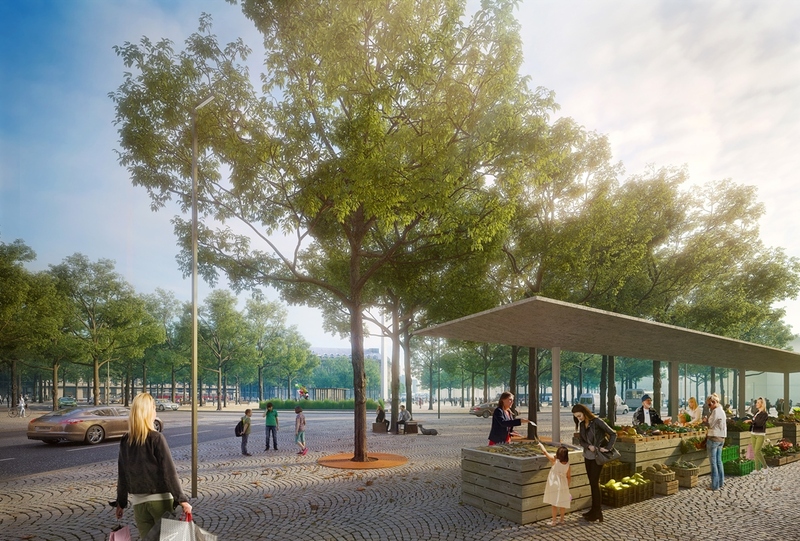 The trees will separate the roadway from the center of the square and thus create an undisturbed pedestrian space. People will easily get to the new square from a new Metro exit or via crosswalks. A striking element of the design is also the central monument, which in the original plans of Antonín Engel was an obelisk. 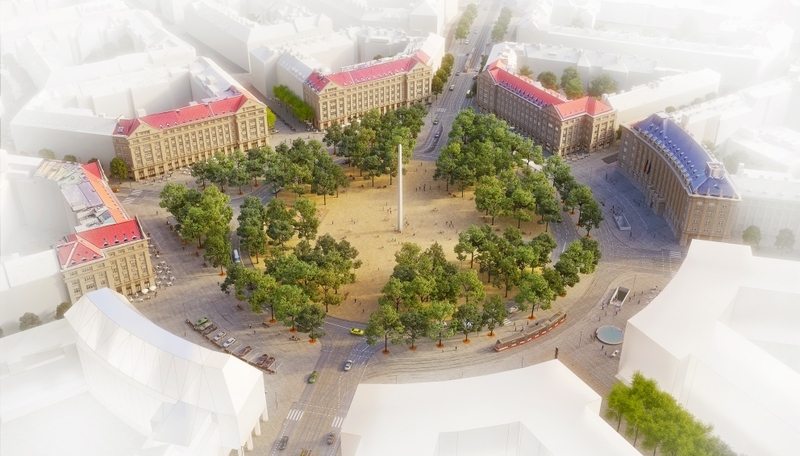 The jury recommended announcing a competition to design this monument to foreign soldiers of the Second World War, which, because of the new traffic layout, will be moved to the northeast part of the square (by Technická Street). The plans also call for drinking fountains, new urban furnishings, and decorative fountains. “The thinking of Antonín Engel greatly influenced Prague. Although his original plan was never finished, today’s generation of urban designers carry on his legacy. The winning design is a good example of this,” added Ondřej Boháč, Director of IPR Prague. The proposal is now being finalized and could be implemented in 5 years. The total amount of the awards and prizes is set at CZK 3 280 000, excluding VAT. The competition was announced by IPR Praha in April of this year. Over 40 proposals were submitted, five of which were selected by the jury for the second round. Of the five finalists, one winner was selected and two other designs received awards. Cars will enter the roundabout from two lanes, not just from one lane like today. The roundabout will have three lanes. The outer lane will serve as a turning lane to smoothly lead cars out of the roundabout. Safe pedestrian movement through the roundabout will be ensured by four crosswalks with synchronized traffic lights. The newly created “quiet” part of the square will ensure safer and more convenient transfer from the Metro to trams. Pedestrians won’t have to cross the road to get from trams to the Metro like today. Cyclists have their own lane in the plan, which runs through the quiet part of the square where there are no cars. This will avoid collisions between cyclists and cars. The plan calls for underground garages on the northwest side of the square (by Technická Street). The authors will plant trees on surrounding streets to give the entire space a uniform feel. Renderings are courtesy of Pavel Hnilička, Eva Macáková and Josef Filip. Learn more about the competition and the other submitted designs.